Netball participation levels have soared in Treorchy. Pic: Rhondda Netball. Jayne Ludlow, Andrew Bishop, Tomos Williams and Gemma Evans have all represented Wales in sports they first played at school in Treorchy. Now, the Rhondda school has a new round ball target as Graham Thomas has been finding out. They have produced Welsh international footballers, rugby players and the newly crowned Welsh coach of the year, but Treorchy Comprehensive School wants a Wales netball star to complete the set. Jayne Ludlow brought more reflected glory to her classroom roots this week when she picked up her trophy at the Wales Sport Awards at the Celtic Manor. It was at Treorchy Comp that the current Wales women’s football manager honed the skills that took her to Arsenal and beyond. So, too, did footballer Gemma Evans, while rugby provided the route to wearing a red jersey for former Ospreys centre Andrew Bishop and current Cardiff Blues scrum-half Tomos Williams. Netball, though, has so far failed to tap into the sporting hotbed of the Rhondda Valley for its national representatives which is why Treorchy Comp is keen made good that omission. The school has partnered with Rhondda Netball to become a community hub that is enabling participation numbers to grow as never before. Providing elite international netballers of the future may not be the primary focus of a programme aimed at gender equality, the promotion of health and fitness and wider opportunity for all – but if some of the 100-odd girls that turn up at after-school training sessions and league matches do go on to play for their country, then no-one will be more pleased than head teacher Rhys Angell Jones. “For years, what made us tear our hair out was that the girls played netball competitively within the school, but then there was no opportunity for them to play outside school,” says the head. “There were simply no clubs for them to join. Up to 100 girls are turning up to training sessions. Pic: Rhondda Netball. “We have always had boys representing county and national teams at rugby and football, but I don’t think we have had any girls playing netball at international level. That seemed to be because they only played netball within school and had nowhere else to develop their skills. Providing stimulating opportunities for children outside of the classroom has always been high on the school’s agenda. The performing arts have traditionally been a vibrant outlet for pupils’ creativity and in recent years the school has produced performances of Fiddler on the Roof, Les Miserables, and Singin’ in the Rain. This is the school where Ian ‘H’ Watkins of Steps fame, first stepped out. In sport, however, the established male sports of football and rugby have tended to dominate, not least because schools in the area have been able to integrate themselves within a strong network of local clubs and well-resourced governing bodies. For netball, it was a different story. Outside of school, there was little on offer. Once girls had left school at 16 or 18, and put down a ball for the last time in the gym, then they were unlikely to pick one up again. Treochy Comp identified the problem and decided to create a netball academy within the school that tied in with the emergence of Rhondda Netball under its founder Lawrie Davies. Jones adds: “Sport is important. A few years ago, we created a football academy. We put football into the curriculum for post-16 children. It enabled them to choose football as an option. “It gave them eight hours of football as well at a good standard built into their week. It means that jointly the school and Rhondda Netball now offer training nights and league matches for age group teams, as well as the in-school academy for the over-16s. With close to 1,700 pupils at the school, that’s a big undertaking – especially when there have not been the foundations laid by an active netball club scene. 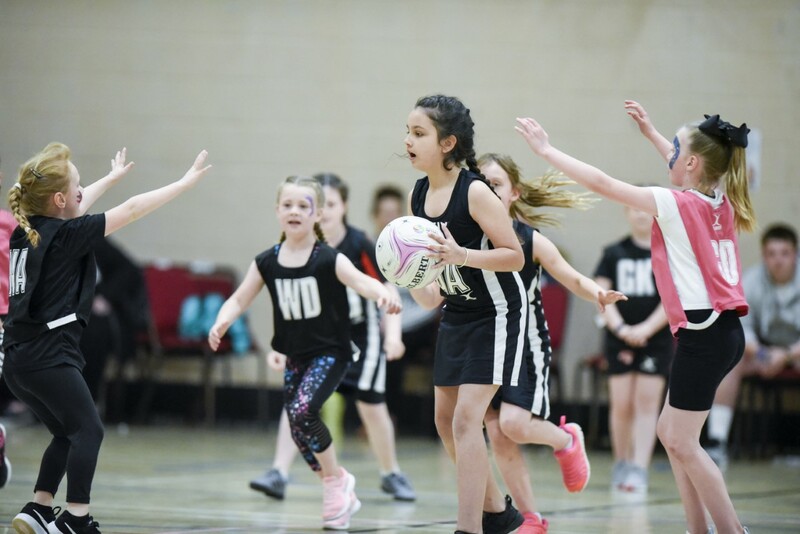 There are also sessions aimed at primary school girls – the Rhondda Rascals for under 5s & under 7s – as well as the Back To Netball initiative for those of all ages whose school days are behind them. “Quite often, when I have asked our female PE teachers why they can’t operate things at the same level as football and rugby, they tell me it can be difficult to access support,” says Jones. “There are clubs galore here for rugby and football and the like, so WRU and the FAW are active in this area. That’s not the case for sports like netball and hockey where the budgets are much smaller. Wales enjoyed a hugely impressive Women’s World Cup qualifying campaign. By working closely with Rhondda Netball, the schools and head teachers like Jones have been able to be catalysts for change. The model is innovative and it’s hard to argue with the results. Other schools and their heads in the area have also got on board and as a result of their determination to level the playing field for boys and girls, netball is thriving. “We’ve supported the development of male rugby and football in the region so there was never any question about us doing the same for female sport” says Jones. “It’s a benefit not just for our girls, but for the whole community. Participation rates within our own school set-up are significant and it’s hard to believe the numbers that are now playing netball. “I went down to watch our girls play netball the other day and there were loads of people there and I’m sure that can be attributed to our partnership with Rhondda Netball. Netball is becoming a much bigger deal to everyone because the opportunities are now there. “I think Lawrie and his team are doing a brilliant job for the community. Hats off to him. He’s got energy and enthusiasm and believes that everything can be done. It’s an entrepreneurial mindset. Treorchy Netball Club. Pic: Rhondda Netball. “There was a gap that needed to be filled and they are filling it. Hopefully, it will go on to greater success. “Sports need to engage youngsters to come into their spheres and then work hard to keep them in. Otherwise, they can be tempted to go off to other sports, or even just spend time on the X-Box. That future Welsh netball international from Treorchy could be hooked already.